Which software do you use while playing slots? Casino slots have had along history spanning from the late 19th century to date and has seen the machines change its shapes and sizes. Charles Fey was the first person to invent what is believed to be the first casino slots machine in around 1897 in San Francisco. He called it the Liberty Bell and it had three reels and one pay line. 10 Symbols were used on the reel which included cards suites like hearts, diamonds and spades and other features like stars, horseshoes, and bells among others. It had a slot for inserting the coin and a bottom tray for collecting the winnings. 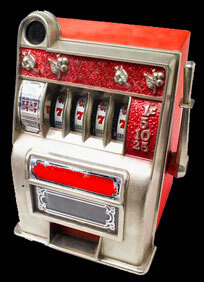 Herbert Mills developed another slot machine around 1900 based on Fey's model. He called his machine the Operators Bell. He included up to twenty symbols introducing fruit shapes as well. There significant differences in design such as a larger window which allowed players to see the combinations symbols and much of the reels. One Mill's old associates O.D. Jennings formed his own company which was to see the increased innovations in slots designs. Between 1950 and 1960 he introduced the first multiple pay line machines with 5 pay off lines, at the top, in the middle, at the bottom, and two diagonal pay lines. Jennings introduced the 4 reels slot machines and electric lights. Other manufacturers like Bally Corporations and International Gaming Technologies have also had their share of contribution in the development of modern slot machines. There were growing anti gambling sentiments in the beginning of the 20th century. This saw some camouflaging of slot machine games where they took coins but paid back chewing gum and candies instead. A player would then change these products for money inside the building if he so wished. Slots almost disappeared completely from the public at the peak of government crackdown which saw many states pass legislations banning slots. Much of the prohibitions eased in the 1930s starting with legalization of gambling by the state of Nevada in 1934. But around that time other states were still hostile to slots especially in New York where mayor la Guardia is known to have gone round knocking down slots with a sledge hammer. Many players went to play on ships anchored off the US coasts as they were believed to be in international waters outside the jurisdiction of the US authorities. Slot experienced faster growth after it was legalized in Atlantic City in 1978. The game spread to places like India in the 90s as it spread all over America and other parts of the world. Slots survived a dangerous onslaught to become today's number one casino game with many types and its revenues exceeding two thirds of all betting revenues in many casinos and states around the world. Welcome to 777 Slots website where every visitor will have a chance to meet and try different variations of slots in order to choose the best one for himself/herself.